Last year's participant of TechHR Startup Program, inFeedo has grown its business with 65 companies on board. With its AI chatbot Amber, it is currently influencing the lives of 70,000+ employees. Read here to know more about their journey. Each day, a few employees at MakeMyTrip begin their work with a greeting from their AI colleague - Amber. 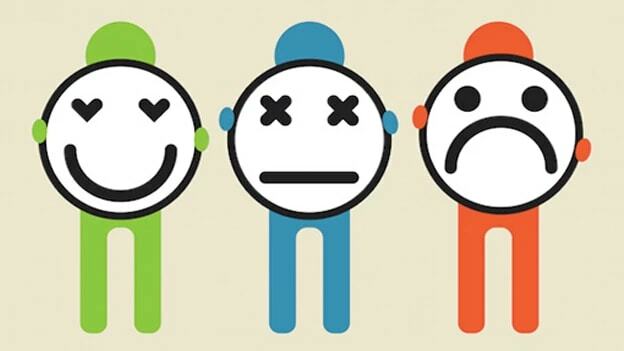 She knows which employee is happy, which employee is disengaged and which employee is having a tough time with their manager. Through constant interactions, the chatbot Amber is helping bring the voice of employees to notice, enhancing their experience and making the work of HR easier. Amber is the product of people analytics startup inFeedo which was founded in 2013 by Tanmaya Jain. From 2013 to 2016, inFeedo was solving the HR challenges through other tools and solutions. It was in 2016 that Amber was born. The journey of Amber is rather interesting. It is the product of a month of rigorous work of Tanmaya Jain, CEO and Founder, inFeedo and his Partner and Chief Product Officer, Varun Puri and their team. Three years into his startup, Tanmaya realized that he had reached nowhere near his initial dreams to create something fascinating for HR. In June 2016, after he hit rock bottom and thought of shutting down his company, he decided to give one last shot. A book, Sprint, invented at Google by Jake Knapp motivated him to take another chance before he gave up entirely on his dream. Sprint was like a guide to building a validated prototype from an idea in just 5 days. Inspired by the book, Tanmaya and his team spent the entire month of August 2016 working rigorously and running several such sprints. They worked night after night non-stop, with the whole team sleeping in the office. The result of all this hard work and determination led to their AI chatbot - Amber. Remembering the most critical days of his life Tanmaya exclaims, "In the middle of those sprints, I found the excitement I had been searching for 3 years. It just came back out of nowhere." “It was in these days that the seed of Amber got ready and without even having the final product we had the buy-in of 5 HR Heads. That was the moment when we felt that okay we are onto something,” adds Tanmaya. In September 2016, Tanmaya and Varun took the validated prototype and landed in India’s version of Shark Tank, The Vault show. With the realization that individuals spend a good amount of their time in work and organizations, Tanmaya decided to create a solution that touches on enhancing the experience of an employee at work. According to him, “Whenever we look at life, we look at memorable experiences and since employees spend the majority of their time at work, we need to work on their experiences in the workplace.” He adds, "And the first step in influencing their experience is by accurately measuring it." Beyond the annual surveys that assess the employee engagement from the organization’s point of view, Tanmaya wanted to create a solution which is more human, accurate, employee-centric and captures real-time data. How does Amber actually work? “In one line, Amber is an AI Bot that talks to employees regularly and basis the interaction it tells who is unhappy and who is most likely to leave with the exact reason why,” claims Tanmaya. There are a set of questions that Amber shares with every employee right from their 1st day of joining till their last day. And at each touch point, the questions keep changing according to relevance. These questions are framed on the basis of recommendations from inFeedo’s in-house psychometric psychologists and the inputs provided by the HR leaders they work with. Based on the quality of answers, the responses are differentiated into two segments, positive or negative. For negative responses, it further deep dives into the problem and asks additional questions. When an employee expresses repeated unhappiness, say for months, the HR must know that it’s a ticking time bomb. So through Amber, pockets of various employee challenges and issues are identified and addressed accordingly by the HR and the senior leaders. “Through Amber, we are trying not just to solve the challenge of attrition, but also trying to bring to notice the people who are disengaged. And based on the output received the HR and the senior leaders can better understand the challenges of their employees and work on making their lives better,” shares Tanmaya. From raising 75L seed funding in March 2017 to participating in the TechHR Startup Program in 2017, inFeedo has come a long way. When the engagement tech startup raised money from Dheeraj Jain, Managing Partner, Redcliffe Capital, it already had 16 companies on board. Then at the time of People Matters TechHR 2017, their clientele grew to 25 companies & now since the Vault Show, inFeedo has grown 12x with 65+ companies out of which 5 are based out of the US and the Middle East. 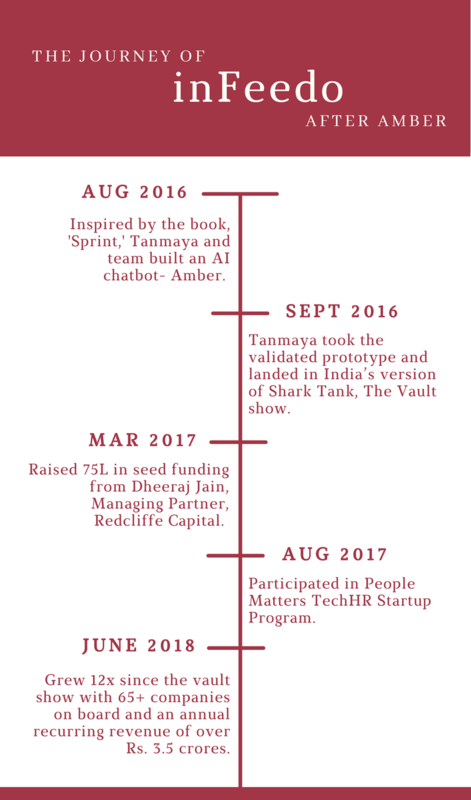 Tanmaya upon recently completing 5 years with his 25 people strong team looked back at how the HR tech startup founded in 2013, which almost shut down in 2016, today is touching the lives of more than 70,000 employees. After making a strong base in India, inFeedo will now be looking forward to further improving its product Amber and expanding its scope of business in the US and the Middle East. “The idea is to expand in the US and the Middle East in a way that it crosses India’s revenue for us. This is our plan for the next 6 months,” reveals Tanmaya. The product team led by Varun is working on adding the element of Machine Learning, making Amber more predictive and relevant. The idea is to capture the inputs of the employee leaving the organization and based on the responses making the questions for current employees more ‘problem’ specific. As per the plan, the employees after 90 days of leaving organization will get a set of questions to answer. The reasons for leaving will then be collated. “Conducting the exit interview after the successful transit of an employee will ensure that they fill the responses more honestly and fearlessly,” suggested Tanmaya. With the HR Technology market expanding rapidly, a lot of startups in engagement have sprung up in the recent years and are providing a variety of solutions in this space. For instance, startup-like Hyphen offers a mobile-first listening & engagement solution. Another startup n!Gage, through a continuous employee feedback platform, allows managers to get real-time data and insights about what their employees are feeling. Amidst such competition and variety of available employee engagement solutions available in the market, how inFeedo ensures its uniqueness and scales towards further growth is something to watch out for. inFeedo was one of the participants of TechHR Startup Program 2017. Click here to be a part of the TechHR Startup Program 2018 and get the opportunity to meet and network with global business and HR leaders on 1st, 2nd and 3rd August.